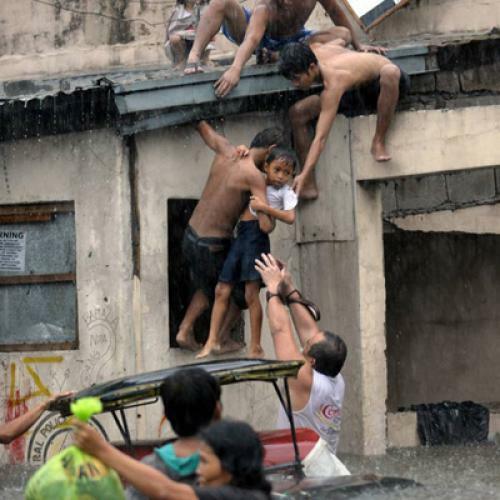 Your babysitter's family is stranded on the roof of a flooded building in the Philippines. What do you do? Thursday October 8, 6:30 a.m., the phone rings. I pick up sleepily. "My family! My family! Magda … my family!" I hear sobbing and low, sad groans on the other end. It is our babysitter, Maricel, originally from the Philippines, where two typhoons--"Ondoy" and "Pepeng," as they are known locally--have caused floods that, over the last few weeks, have killed hundreds, left hundreds of thousands homeless, and inflicted damage estimated in the hundreds of millions of dollars. Almost seven years ago, when her son was 15 months old, Maricel made the difficult choice to leave him with her parents so that she could make money in America. Now she tells me that her seven-year-old son, her parents, her sister, and several of her nieces, aunts, and cousins are stranded on the second floor of a shaky 200-year-old house on her family's farm compound, about a five-hour drive from Manila. Night is falling, and the water is rising. The single-level home in which her son lives with her parents has been severely damaged. I check the news: The conditions are bad and getting worse. People are dying in the floods, assistance can't get through, resources are scarce. The U.N. appeal for the Philippines raised maybe a quarter of its $74 million target. So there they sit, 19 people in an unstable, largely wooden structure, with no flotilla of lifeboats or helicopters from well-to-do countries headed their way. And here I sit, an attorney in New Jersey. Can I save a poor family in a rural disaster zone thousands of miles away? I am about to find out--and, as the flood waters rise, time is of the essence. At that early point in the morning when Maricel calls, I don't know anyone in the Philippines who can help. But I know from her that the closest evacuation center is closed due to flooding and, though the Red Cross is on hand, many need to be rescued. My e-mail goes out to 70 people I know. I add recipients somewhat haphazardly--anyone I know from the Philippines, folks from law and graduate school, a couple people from work, neighbors, college friends, family. I forget some who would likely be helpful. I use bold-face type. I list the names and ages of the stranded family members, the address of the house where they are taking refuge on the second floor. I don't know what to ask, only that my e-mail must request something specific. So I write: "Do you know anyone in the Philippines who might be able to help? Do you know anyone in Governor Corzine or Senators Lautenberg or Menendez's offices?" (I have no idea if this will be helpful, but Maricel and I both live in New Jersey.) "We will pursue options for private rescue." I include links to a New York Times article and a BBC video documenting the storms and floods, and attach three photos of the beautiful family from Maricel's last visit with them. I type "thank you" and hit "Send." I get 47 responses. The people I expected to respond all did; the people who didn't don't require my judgment, though I can't hide my disappointment. I am equally touched by responses such as "I have no money and no contacts, perhaps I can donate clothes?" and "Not having specific contacts to offer, I sent a lot of focused thought, white light, and uplifting energy" as I am by the targeted offers of logistical or financial assistance. It turns out there are several ways to save a poor family from a rooftop in a disaster zone. Immediately, I am introduced to the "Beam me up, Scotty!" option. Three friends refer me to three different "international rescue companies" that provide membership-based evacuation, medical, and security services. The members of these organizations are usually employers who send people to high-risk areas. I am, clearly, not a member, so we're talking fee-for-service. A good friend knows the CEO of Company One from work in finance years ago, and the connection brings rapid and responsive customer service. Within 15 minutes, I'm on speaker phone with two of their "operations" people and Company One has already "circled back" with our mutual friend. (All quotes are approximate; I took notes, but it was a frantic time.) I explain the situation. They seem surprised that I'm calling on behalf of a rural Filipino family that needs to get to Manila, rather than an American who needs to be retrieved to the United States, but they'll take the job. They test the waters: "You realize this can be very expensive." Yes, I realize that. What are the options? Many employed by these companies are ex-military special operations folks. I make some "What are you, James Bond?" joke that falls flat. They tell me they have local "assets" in the Philippines. They can get a helicopter in there, depending on the weather. They want a $50,000 retainer. They'll refund any unused portion, though it could easily cost more. (Their last job was in Uganda and "it got complicated.") I'll need to sign a liability waiver instead of a membership agreement. They'll begin to organize local assets in case I want to proceed. I call my husband to report the price and we begin to think. Time to hustle. By 2 p.m., I'm speaking with a man--call him Derek--from Company Two, in London. Despite providing similar services, Company Two offers more free guidance than Company One, and serves as a sounding board. Company Two is also a membership-based service provider, but makes clear that they "do what they can to help whenever they can," despite my not being a member. Derek is professional and compassionate, and I begin to trust his opinion. He suggests two options--no guarantees either way. His company can activate "local resources," including helicopters or boats, though he tells me both will be "very expensive." He suggests another (cheaper) approach, a way to "dip my toe in the water" before signing on for a full-fledged, privately financed rescue operation. Derek says he can put me in direct contact with trustworthy folks in the Philippines--military and police--who can "focus" local rescue efforts on Maricel's family. Such attention will cost $1,500-$2,000 per day with a three-day estimate. Derek specifies that Company Two's involvement promises integrity in an otherwise potentially corrupt process. It's a fair point: I imagine reading a credit card number to a stranger on the other end of the phone or wiring money to Manila without any guarantees. I ask Derek at what stage in their initial information-gathering process local authorities would become aware of the American interest in this family. I also ask anxiously if, upon learning of my willingness to pay, local entities might then require financial incentive to continue their rescue efforts for this family. Derek reassures me that Company Two's initial informational inquiries on the ground will be general in nature and will not mention Maricel's family by name. Instead, they will ascertain estimated evacuation schedules so we can plan accordingly. It is not clear to me that one can ethically influence local resources to prioritize particular individuals. My husband and I talk quickly about this "cheaper" option, the propriety of "greasing the wheels" and the similarity of the situation to some movie (Russell Crowe?). We are relieved there is a viable way for us to answer this family's call for help. We feel conflicted, certain that other such calls remain unheeded. We commit to doing whatever is required to help Maricel's family. Without asking for a deposit from me, Company Two gathers information relevant to Maricel's family from their local assets--including location, weather, status of local dams, the plans and progress of local military rescue. By 11 p.m., Carl, a colleague of Derek's in Singapore who has taken over for the night shift, has spoken to Maricel's family several times. (To get the cell phone working, one family member made her way to the local gas station to stand in line and take turns charging cell phones from a working outlet.) The family has now moved to another house on the property. All 19 people are on the roof of Maricel's aunt's home, which at least has a concrete base. They are secure, and the rain has slowed, but the specter of another storm looms. Maricel reaches her family, who tell her that several neighbors, including children, have died in the floods. We begin to worry that dams will break, that disease will spread, that food and water will not arrive. Carl will check in with Maricel's family and send news by e-mail while I sleep. He promises to call if anything changes that requires a fast decision. I send an update to my initial distribution list and go to bed. Carl e-mails, as promised, and calls in the morning with better news. The family is inside a house and the water is beginning to recede. They still do not have food or water, but we become more hopeful. Carl says he will put me back in touch with Derek in London as day ends in Singapore. Derek calls to check in and remains in close touch. Company Two has reached its local assets and is on standby. They have not asked me for any money. Unexpectedly, the father of an old friend here in the United States has some political connections in the Philippines from years ago. She reports that her father hesitantly asked if she really wanted him to call in this favor: "I know they're people," he said, "but on a scale of one to ten, how important are they?" My friend has known Maricel for years. "Eleven" she answered, "they're an eleven." Her father quickly reached out to his contacts in the Philippines, and I call him to discuss. He reports a connection to a helicopter pilot in Manila, who gives him a price tag between $2,000 and $5,000 to pick up the family and bring them to Manila. Two more helicopter contacts come from a Filipina-American in New York, Edna, whom I've never met but who was forwarded my e-mail from her colleague, a mutual friend. Edna suggests that Maricel call the pilots to avoid my being taken advantage of as a foreigner. I now have three Filipino helicopter pilots' names and cell phone numbers in my contacts list. My cousin forwards my e-mail to her high-level FEMA contacts. Through neighbor friends, I also reach the offices of Senators Lautenberg and Menendez. And my request makes its way to two contacts at the World Bank. One writes back directly to Maricel to make sure someone from her family stays on the roof at all times to be seen by any rescuers searching for people. The e-mail also makes it to seven other people on the ground in Manila. Edna passes on the name and location of Maricel's family to her cousin in the military in an effort to prioritize their rescue. Edna's cousin calls Maricel's family to check in.The Filipina mother of my daughter's friend e-mails back with a connection to a senator in the Philippines. I am later coincidentally connected to the same Philippine senator by a colleague of mine who had reached out to a Filipina friend of hers. A friend from college makes several calls for me. Insurance companies emerge as a common thread in rescue operations; I speak to several of them. Many large insurers have "specialty lines" or contracts with travel emergency entities to provide these services to enrollees. Another friend generously but hesitantly refers me to her former colleague, the director of a major disaster relief organization in Asia. Her hesitance is understandable: The director is completely inundated with similar requests in this time of disaster. Despite that, the director replies to my e-mail within several hours. He is glad to hear news of our mutual friend and passes on my request for assistance to contacts in Manila. When I get word that Maricel's family is safe, I let him know. He writes back and is grateful for the good news but gently reminds me that many others are still in precarious situations. I know there are countless "elevens" on scales of one to ten. It is an unfair world. The back-to-back typhoons have killed at least 700 people, left some 300,000 homeless, and affected over 6 million more. Damage to the Philippines has been estimated at nearly $350 million--a number that will inevitably rise in the weeks to come. .
More than a week since I was first awakened by Maricel's frantic call, the military has not made its way to her family, and electricity is not restored. The roads to Manila are flooded. Numerous dikes have collapsed. The rain has stopped, but, last Tuesday, a local engineer came to warn Maricel's family that additional floods loom from higher ground. Upon hearing the news, Maricel's father began to have symptoms of a heart attack and his asthma flared. We arrange a backup generator for the family from the next town over. It provides electricity for much of the house, operates the nebulizer, and charges cell phones. Food and clean water are scarce; price gouging is rampant. Standing water will soon bring malaria, dengue fever, diarrhea. We offer to move the family to another area, to rent a temporary home, to find a hotel until all is clear; at the moment, the family wants to stay if they can. I can organize a drop of supplies easily at this point and will do so if Maricel instructs. We, at least, have numerous options in front of us now. It is not so for many others, all of whom are "elevens" too. Magda Schaler-Haynes is an attorney who lives with her husband and two children in Montclair, New Jersey.